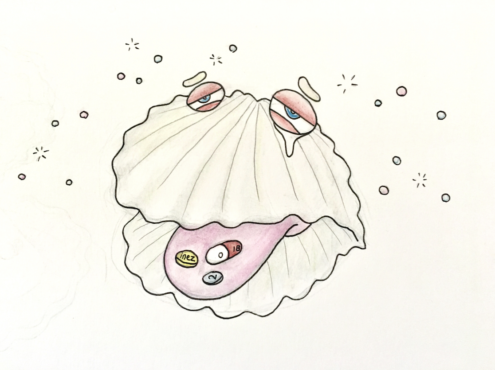 We have all heard the saying “happy as a clam,” but we could never really measure how happy mollusks were until high doses of antidepressants began showing up in their nervous system. According to the CRD, these clams have been exposed to high levels of human medication thanks to raw sewage pouring into our coastal waters. Items such as antidepressants are affecting marine life in a gross adulteration of the natural state of being for the animals affected. Clams are absorbing these antidepressants, and, as a direct result, have their reproduction affected. Other animals face repercussions, too. Studies have shown that shrimp who absorb anti-depressants are far more likely to swim toward the sun above the water, placing them more at risk of predators. They are both literally and metaphorically following the bright light to their death. While things such as SSRIs and birth control pills typically have a positive effect on the humans who take them, they can be incredibly harmful to all types of marine life. Luckily for Victoria, a not-at-all controversial sewage treatment facility is expected to arrive before the end of 2020. Unfortunately for those not-so-happy clams, SSRI poisoning is affecting marine life around the globe. An NCBI study found that over the course of a year of testing off the Portuguese Atlantic coast, 70 per cent of the mussels collected were contaminated with at least one form of prescription drug. We reached out to some bivalve mollusks to get their take on the issue. “I think that antidepressants are very unnatural, and that clams shouldn’t feel pressured to take them just because a doctor says that they should take them. Every mussel feels bummed out sometimes, but they just need a breath of fresh air outside their shell and some exercise. That’s nature’s medication right there,” said Erin, a 41-year-old Freshwater Pearl Mussel. “I’m not too concerned about medication in the water right now, to be honest. What’s really been on my mind of late have been boat-trails. Yeah, boat-trails! Everyone thinks trail-dispersed chemicals are a human problem, but we get those same chemicals once they fall into the ocean from boat propellers. The government is dumping mind control chemicals into our oceans, and no one is reporting on it! I’d like to see CBC TRY to cover that story,” said Thomas, a 25-year-old Zebra Mussel. “I don’t really feel strongly about the sewage treatment plant or a lack thereof. I’m just living here to get my degree in Mollusk Arts. As long as none of the contaminants get carried along the California current to my homeland, we’re all good!” said Elon Mollusk, a 30-year-old California Mollusk. Meanwhile, oysters in Oak Bay are holding a protest and refusing to give pearls to the Municipal government until they agree to get the medications out of the water.